Watch Nancy before starting the training – uneven cuts, no control, slow. After half way through the bootcamp and after practicing – Cutting over 8 pounds of newspaper – see her progress! After some practice see here Fast, accurate and controlled cuts. Developed hand muscles with proper positioning and movement will greatly improve your cutting technique. Faster cuts = less fatigue = more money = happier clients! Sign up for my live class at KC Beauty Academy in Los Angeles. If you can’t make it, get my dvd set! I go through the same information and show the proper exercises and how to practice correctly. If you’re in the area and want to see my cutting technique – book me for your haircut, hair color, color correction, at the Hiroshi Beverly Hills Salon. 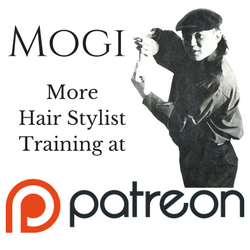 If you own a salon and want to teach your staff my techniques – contact me!